Ok, so I know this is, basically, a Land Before Time forum, and that implies Dinosaurs in itself, but...I'm wondering how many of you guys and girls have an real interest in dinosaurs on a paleontological scale. Me, personally, I am an aspiring Paleontologist. I have been collecting and reading books on the subject, watching anything dinosauresque I can get my hands on, and generally doing independant study on them since I was like 6 years old. They really capture my imagination. I'm just wondering if there are any others approaching my fascination with these ancient scalies here. I used to be interested in becoming a paleontologist. Found a few fossils myself though they were all shelled sea creatures. My favorite, which I no longer have, was a straight-shelled nautiloid (sp?). I never found a dinosaur bone, although I used to have a tiny dinosaur fossil that came with a raptor toy I had once. Obviously I lost it. It was the size of a pebble. 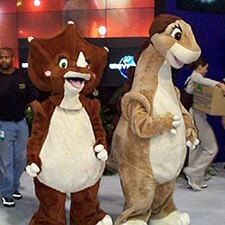 I have an interest in dinos for real and from a paleontology stand point. I'd guess sea creature fossils should be common in parts of the us since I think at one time parts of it was underwater. I can never remember all the scientific names and technical stuff though. Wish I thought of that, but I was a preteen at the time, so I didn't know any better. So instead of being kept somewhere safe, my tiny dino fossil got a one-way trip in a vacuum cleaner bag. i've considered being a paleontologist before but i don't think im interested in it enough to go through with it. i did read a book called "the day of the dinosaurs". It was about paleontology and stuff, but the only reason why i was reading it was because i never had a book to read for english class, so i just grabed it from a shelf of books. I've always had an interest in dinosaurs, but I'm from Denmark, which was covered in water during that age. I still have a great interest, and I'm heading for Biologist, but you have to specielize, so I might do that into prehistoric animals. There are many areas you can pick to study. An age when the area where you live, or want to work was not covered in the oceans, or pick aquatic life, ancient plants, or any number of other areas. No need to rush. Heh heh, same story here ! And you never know where that may take you. Sounds like a good plan as long as it feels correct to you. Sorry Kor, but your reply was to my post or to some previous post? To yours, the one just previous to mine. Sorry for the confusion. And maybe some non famous people that the famous people got the saying from. I study Dinosaur Evolution and Eggs in my spare time, fascinating subject! Paleontologist is something that I want to do beside my other plans in life. As for nowdays, I'm not a Paleontologist, but a fossil hunter. But as it happens, I might have some guidelines for those members here that fancy fossil and dinosaurs. This is the biggest online fossil community forum in the world, me being global moderator there! A huge Dinosaur discussion forum! Hope you'll enjoy it if you join any of em'!